In 1933, RG Bhide, the chief editor of Kesari (the RSS mouthpiece) and the general secretary of the Akhila Bharatha Hindu Mahasabha delivered an incendiary speech at Mundajje village, 70 km from Mangalore. To this day, his words echo in the speeches of Sangh leaders in the region such as Kalladka Prabhakar Bhat, MB Puranikand and Jagadish Sheneva. In the speech, Bhide criticised the demand for Pakistan, the Khilafat movement and called Muslims "born soldiers of their faith". He said they could never be part of 'Hindu Rashtra' as they were deshdrohis (anti-national). It was the first time that an anti-Muslim position was articulated in a big way in coastal Karnataka. Present day Dakshin Kannada and Udupi (which previously was the united South Kanara) has a well-oiled network of on-ground and virtual activists who take it upon themselves to keep their circles informed about everything the Sangh wants in the public domain. Social media sites, such as Facebook and Twitter, have various troll groups promoting the Sangh ideology, which according to Facebook Audience Insights, are the most viewed in the region. Their presence in colleges, among working professionals, the police force and even the media ensures that whatever the Sangh wants to be circulated reaches almost every individual in the district. Back in 1933, Bhide's speech was like any other political manifesto which was on offer in this part of the British Madras Presidency. At the time, the Mahasabha's anti-Muslim discourse was popular mainly in North India. The Mahasabha went about its business along coastal Karnataka with single-minded focus. They organised several meetings to talk about atrocities allegedly committed by Muslims against Hindus and their motives to divide the nation. Religious spaces were common spots. On 10 April 1941, during the festival of the Rajarajeshwari Temple in Polali, 20 km from Mangalore, the Mahasabha's leaders took centre-stage. In their speeches, they talked about the Muslim League's demand for a separate Pakistan, even though the local Muslim population had never identified with the League, which was partly because the Muslim League didn't have a branch in these areas. Nevertheless, they passed a resolution to organise mass protests against the Muslim support for the creation of Pakistan. Coastal Karnataka, however, wasn't affected by the Partition as much as the rest of the country, even though it had a Muslim population of nearly 20 percent. In fact, when the narrative completely shifted from conversions by Christian missionaries to the alleged anti-Hindu activities of the Muslim community, it didn't immediately set the region on fire. These provocations didn't lead to clashes between the communities. The leaders of the Sabha, however, trudged on and organised meetings with an anti-Muslim theme at regular intervals. In January 1946, a public meeting was organised in Karkala where advocate E Ramamurthy and Keshavaramachandra Shenoy spoke about the atrocities committed by Muslims on Hindus of Bengal. In 1948, a public shuddhi (purification) ceremony was organised in Kinnigoli to convert a Muslim family to Hinduism. When the RSS arrived in 1941, it followed the same template as the Mahasabha but ended up being far more successful in the long run. The Mahasabha died out across the country after the Partition. Initially, the RSS in Mangalore was confined to Gaud Saraswat Brahmins strongholds such as Pentlendpet, Dongarakerry and Car Street, the same neighbourhoods that birthed the Arya Samaj and the Brahmo Samaj. Public meetings of the RSS were held at its birthplace, the Canara High School in Mangalore. The institution was a Sangh stronghold then and it continues to be so even today. The school was started in 1893 by the founder of the Gaud Saraswat Brahman Parishad, Ammembal Subba Rao Pai. He also founded the Canara Hindu Permanent Fund in Dongarakery, three months after Canara Banking Corporation Fund was founded in Udupi by a leading Muslim merchant and landlord Haji Abdullah in 1906. The financial institution, started by Pai, is known today as the Canara Bank and the one started by Abdullah is known as the Corporation Bank. 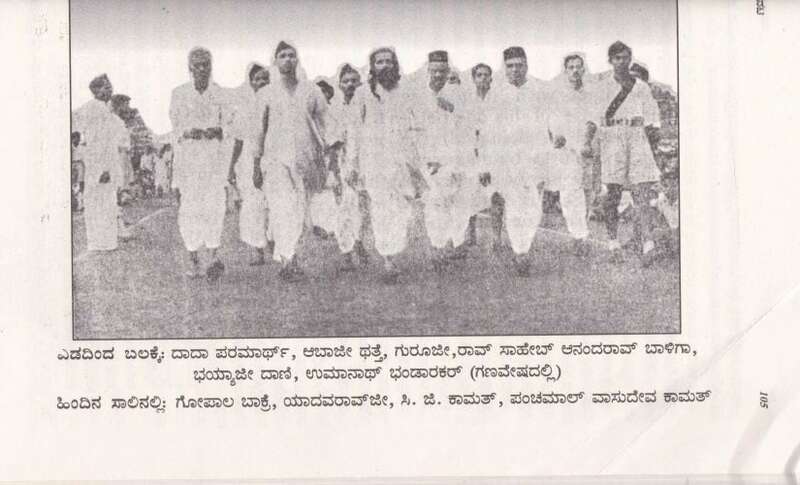 MS Golwalkar's hopes from the unit started in South Kanara can be gauged from his regular visits to Mangalore after the organisation was formed in 1941. All his visits started with a visit to the Venkatramana Temple on Car Street, the main centre of the Gaud Saraswat Brahmin community's faith. During this period, non-Brahmins weren't allowed into the temple. This, however, changed a few decades ago. On the other side of the political debate, organisations such as the Jaathiytha Virodha Sanyuktha Sangha, Anti-Communalist United Front and the Anti-Fascists United League were formed and were led by a diverse set of civil society leaders such as B Shankar Bhat, M Ramappa, DMA Rafiq and KMR Shetty. They countered the progress of the RSS by organising counter rallies and used terms such as 'casteist' and 'communal' to describe the Sangh. They also blamed the Congress high command of being soft towards the RSS. In one instance, the Rashtriya Seva Dal organised a program, which was close to where RSS meeting was held with Golwalkar in attendance, urging people not to take part in it. There was very little political space at the time for the RSS to grow as Mangalore was a Congress stronghold, and leadership of the party was shared among others, by Gaud Saraswat Brahmins and the Bearys. 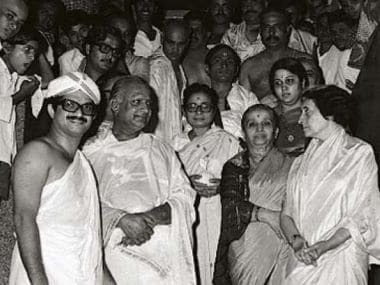 This political alliance between the Gaud Saraswat Brahmins and Bearys, otherwise rivals in every sphere, emerged in the Congress as a result of the visit of Mohandas Karamchand Gandhi and Moulana Shaukat Ali in 1920. Some of the earliest Muslim political leaders, including Kunhamma Haji of Mangalore and Hussain Wodeyar of Farangipete, extended support to Mahatma Gandhi when he visited and later became a staunch Indian National Congress supporters. Dr MM Salih, Kunhamma Saheb, Dr MB Mohammed, Matada Mame, Yousuf Saheb and Athoor Halyara Ibrahim Haji were popular Congress leaders who mobilised Muslims from the region for the freedom struggle. As Golwalkar struggled to find non-Brahmin takers for his organisation in the coast, there was nothing much he could do till much after the Independence. When five lakh Dalits were converted to Buddhism under the leadership of Dr BR Ambedkar in 1956, conversion as a means to escape caste inequalities inherent to Hinduism resurfaced as a strategy. "Golwalkar had recognised the power of the sectarian chiefs-the Mathadheeshas. He levelled down their egos and their ideas of self-prestige, and yoked them to social causes, especially the removal of untouchability, something they had not contributed towards for over a millennium." 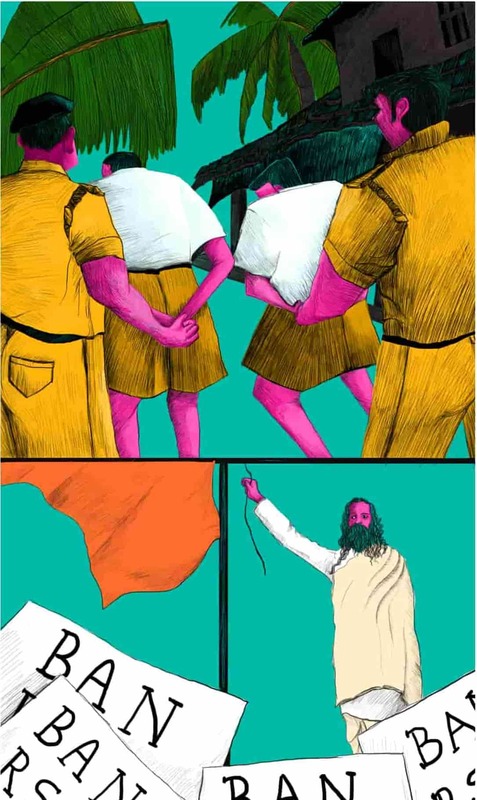 In coastal Karnataka, Golwalkar recruited Vishvesha Teertha, a powerful young man who started an expansive program aimed at gaining support from the lowered castes. Teertha — the seer of the Pejavara Adokshaja Mutt or simply known as the Udupi Krishna Mutt —became Golwalkar's star pupil. The Krishna mutt is the most powerful of the eight such monasteries in the temple town of Udupi which has drawn Brahmin pilgrims from across the country for centuries. 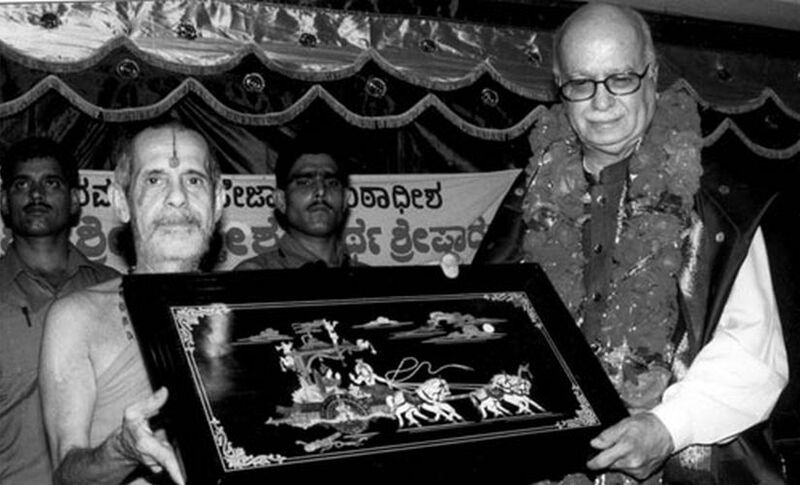 Vishvesha Teertha with LK Advani. Now 87, Teertha rose to become a key player from the South in the Ram Janmabhoomi campaign. In the late 1940s and 50s, Teertha worked steadily towards building an opinion against religious conversions of lowered caste Hindus. He started a movement to enter Dalit neighbourhoods that were considered impure by ritualistic Hindus. Teertha travelled the country in those years of his political career, advocating internal Hindu reform and not a conversion, as a solution to caste discrimination. "He didn't have a lot of takers from within the Brahmin circles, including the mutt's," his nephew and Professor Rajaram Tholpady told Firstpost when the team him to understand more about the seer. Tholpady, a supporter of the seer during his early days, eventually fell out with him after his active participation in the demolition of the Babri Masjid. But it had a profound impact on the lowered castes that a Brahmin of his stature was intermingling with them. Ironically, to this day, Dalits and other non-Brahmin castes are not allowed into the sanctum sanctorum and the dining area of the Pejavara seer's (Vishvesha Teertha) own monastery. A measure of the local Brahmin community's rigidity can be gauged from the fact that the Krishna Mutt has a powerful anti-caste legend set in the medieval era. 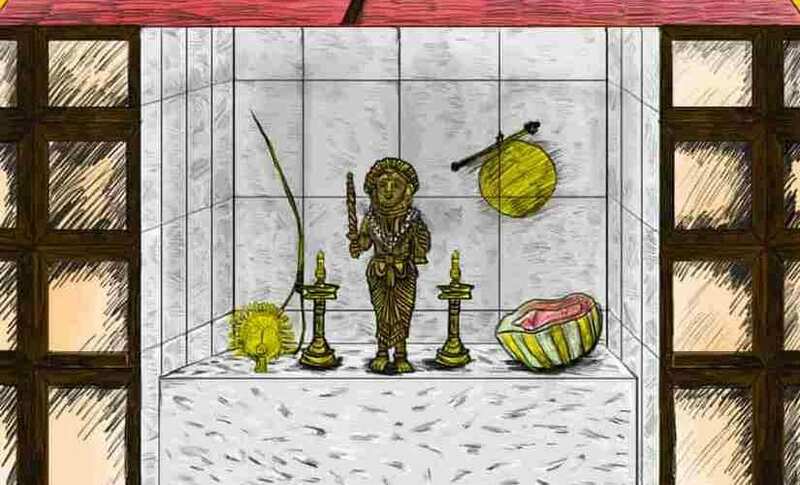 Even in those days, lowered castes couldn't enter the temple and were only allowed to take a peek at the deity from a little hole in the wall behind the idol. But when Kanakadasa, a lowered caste saint and one of Krishna's greatest devotees, was prevented from entering the temple from the front entrance, the Krishna idol is believed to have spun around to face the hole in the wall. To this day, the statue has its back to the main door but the lowered caste devotees still can't enter the temple. Even though he didn't transform his own community's view on caste discrimination, Teertha soon emerged as the region's high-priest on matters of Hinduism and Hindutva. Theertha's programs, however, became popular among the lowered castes only from the 1960s onwards (almost two decades later). When in 1981, more than 1,000 Dalits converted to Islam in the temple town of Meenakshipuram, Teertha led a slew of damage-control programs on behalf of the Sangh. M Devadas, a senior leader of the Dalit Sangarsha Samiti (DSS), however, tells a different story. A tuition teacher, Devadas told Firstpost what he knew about the seer, who was portrayed as a revolutionary among the lowered castes, especially Dalits. Devadas agrees that Theertha was revered by many, and was regularly invited to functions. He recollected how his father invited Theertha in 1962 for the inauguration of a community hall in Bajpe. The program consisted of felicitating achievers of the year where the women would spread out their pallus (loose end of a sari) in front of the Swamy and he would drop the awards from above without touching the awardees. "Most Dalits would invite him for our programs as he was known as the 'liberal Swamy' but this kind of contradiction was visible too." The 1920s, as we have seen, belonged entirely to Gandhi and the Congress. Between 1921 and 1935, Gandhi visited Mangalore thrice; the region was bristling with anti-British nationalist fervour. 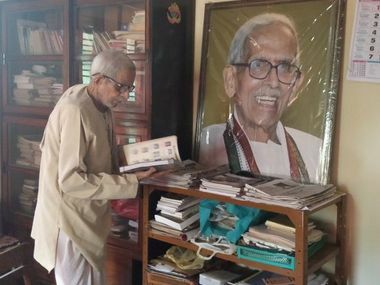 Ninety-two-years-old Tulu author and Sangh ideologue Aerya Laxminarayan Alva was a Congressman when he first heard Gandhi speak at Bantwal in 1935. "The urban educated classes and the peasantry were in his thrall. Campaigns of the Congress like 'uuluavane holadodeya' (land to the tiller) gathered support from a large section of agrarian peasant communities which troubled landed communities," says Alva, who eventually switched sides and served as the state president of Vishwa Hindu Parishad from 1979, for a period of twenty years. In line with their national leadership, which in the 1940s sided with the British, the coastal leaders of the Hindu-right, too, stayed out of the freedom struggle as well as the other movements such as land reforms and tenancy rights that were mustering support for the Congress. Meanwhile, the RSS, apart from organising programs for their national leaders like Golwalkar, was mainly strategising on expansion. They hardly had any direct involvement in the freedom struggle. Some RSS leaders and cadre in the region participated individually. Under the leadership of RSS Mangalore head HV Sheshadri, his recruits started setting up shakhas in urban Mangalore and smaller towns like Udupi, Puttur and Karkala. In the bordering town of Puttur, the credit of expanding the RSS shakha network goes to the areca nut-farming community of the Havyak Brahmins. Urimajalu Ram Bhat, 92, is one of the tallest leaders from the community today and despite his age a regular in the elders' gallery at all important Sangh events even today. In a conversation spanning five hours, Bhat recalled his entry into the RSS. "I attended a shakha for the first time in 1942, when I was in Class 8. I didn't have any inclination towards it initially. There's an interesting story behind it." "There was a mountain near my house and I desperately wanted to climb it but none of the elders would take me. My school senior, Narayan Bhat, promised that he would help me climb the mountain if I joined his RSS shakha. This was the first time I heard what the RSS worldview was and I was drawn to it instantly," recollects Bhat. After finishing his schooling, Bhat moved to Mangalore for further studies where he was groomed at the Vidyaranya shakha in Police Lanes. It was run by the then district president of the RSS Karkala Sadashiva Rao. 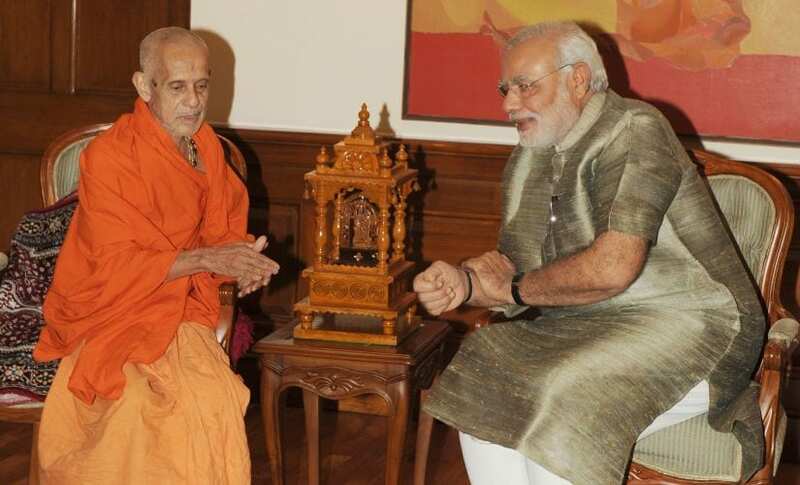 Bhat says he also regularly attended RSS meetings organised at the Venkatramana Temple hall. He recounts attending the first RSS statewide youth camp in Bangalore in 1948. "The Chief Minister of Mysore Presidency K Chengalaraya Reddy attended the camp and stayed with us. There were more than 5,000 of us from all parts of the state. Every division displayed their drills with drums, flutes and lathis. This was the first time I was meeting so many RSS workers, it felt like my organisation was at its strongest." This surge quickly vanished in the months following the killing of Gandhi by Nathuram Godse a Hindu extremist. The RSS was banned even though they said that Godse had quit the organisation before the assassination. "We organised protests every day led by our head Venkatramana Bhat," says Ram Bhat. Soon, Ram Bhat and his RSS cohorts were arrested. He shudders to this day while recollecting those events. 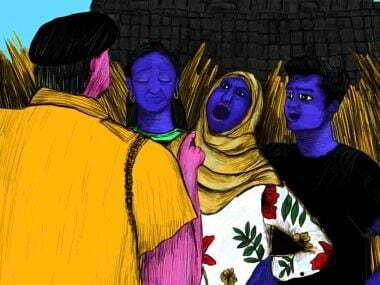 "One day, as we were marching from Car Street to Bunder, we were beaten up badly by the police and dragged to a police station where they tortured us. My father cried when he saw the state I was in." 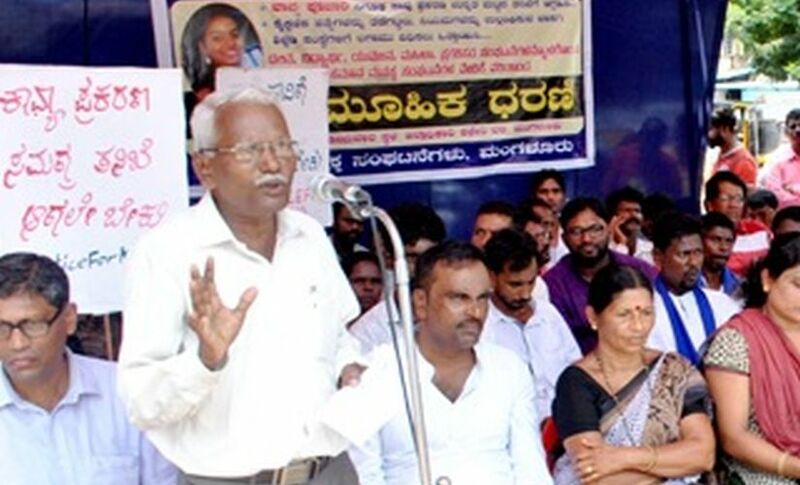 Bhat, Karkala Sadashiva Rao and 45 other RSS workers were arrested from across Dakshin Kannada during the RSS ban. When the ban was lifted in July 1949, despite huge resistance Golwalker came back to Mangalore and hoisted the National Flag at 'Sanghniketan', the RSS headquarters at Pentlendpet. Stones were thrown and numerous attempts were made to disrupt the gathering. Incidentally, during one of his visits in 1924, Gandhi had stayed and conducted meetings just a few blocks away from where Sanghaniketan stands today. Gandhi had stayed at Saraswati Nivas', the residence of Nagar Ramanath Shenoy, a local Gaud Saraswat Brahmin businessman. Sudha Rao gets a call during Gandhi Jayanti every year and she recounts the same story. "Pentlendpet was renamed Gandhinagar as a tribute to Gandhiji and the Gandhi Park was built opposite our house," says Rao, the daughter-in-law of late Ramanath Shenoy. Pentlendpet, a Gaud Saraswat Brahmin neighbourhood, was the centre of all political activity during that time and so it is only natural that Gandhi stayed here. 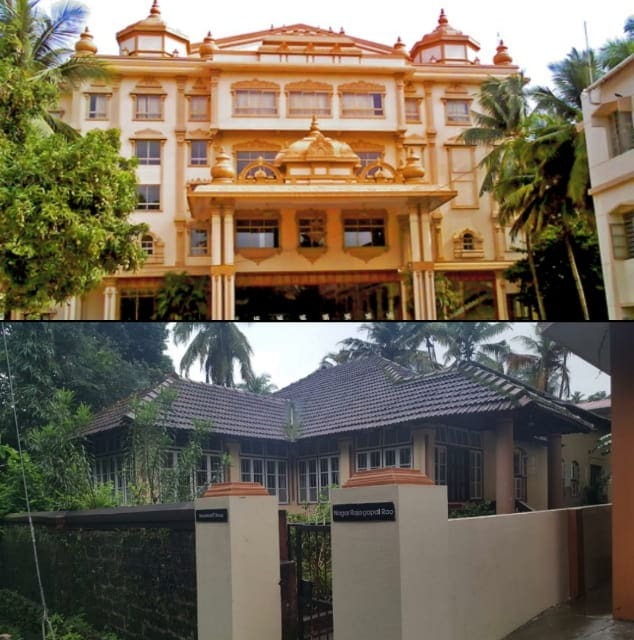 RSS headquarters - Sanghaniketan (top); Saraswati Niwas, where Gandhi stayed (bottom). Though natural, what is ironical is that a few decades later, the RSS started its headquarters in the same neighbourhood that once served as a refuge for Congressmen and leaders of the freedom struggle.